The Star Pack sets you on a course to greatness in New Eden, giving you unlimited access to ships and skills with 1 month of Omega time. You also get 2x Multiple Character Training Certificates, allowing you to train multiple pilots on the same account simultaneously, as well as 500 PLEX to sell for ISK or spend in the New Eden Store. This pack can only be purchased once per account. 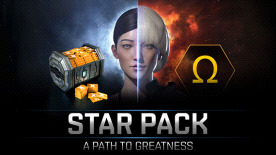 This pack can only be redeemed once per EVE Online account.